If there is one thing you can be certain about in any UK election, it is that the vast majority of the press will be hostile to Labour. The likes of the Times, Daily Mail and (of course) the Sun will claim to be “fair-minded” and “considered”, etc. before announcing yet again that they are backing the Tories. The current election is no exception to this rule. The only anomaly to this was during the Tony Blair years, when the Tories were considered so unpopular that some national titles decided to give critical support to Labour. However, they were comforted by how right-wing New Labour and Blair were; offering support was therefore deemed an acceptable risk by the press barons who in truth actually decide editorial policy. 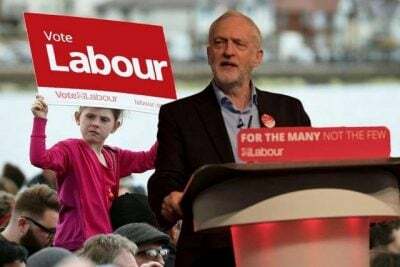 The support by the press for the Tories this time round has, if anything, been even more emphatic than usual, mainly due to their mutual hatred of the EU, but also because of Jeremy Corbyn and what he represents. No lie, no personal insult, and no twisting of the facts are considered too great for these guardians of free speech. Just as the bosses’ press now fawns over Theresa May (echoing the same toadying that we saw when Maggie Thatcher was in office), so they all rush to stick the knife in to Corbyn at each and every opportunity. They have certainly had practice, as this has been their approach to Corbyn ever since he was elected leader of the Labour Party in 2015. When people talk about Corbyn, it is the image presented by the Tory press that they often see. Of course this hostility to the Left on the part of the right-wing press will come as no surprise to anyone. In the 1980s it was said that the Tory Party was in daily contact with Fleet Street, coordinating how the media reported events, particularly during elections. Every attempt was made to shape people’s opinions and views. No doubt similar arrangements exist today. Indeed, all the press barons quickly came on board in supporting May’s U-turn about calling a snap election. Even the Daily Express – whose owner decided to back UKIP last time around in revenge for the Tories not giving him a knighthood – has been toeing the Tory line. So what about the alternative “liberal” press? The Daily Mirror has backed Labour so far, but again they have been hostile towards Corbyn over the last two years. The Guardian, that beacon of the wet middle-classes, continues its love affair with the Lib-Dems, despite the bitter experience of the coalition government. If anything, they have led the way in attacking Corbyn at every opportunity, usually linked to endless calls for a new centre-left re-alignment. In this task, the Guardian have been aided by a mob of Blairite rent-a-quote MPs, who have popped up at every opportunity to add their moans to that of the paper’s regular columnists. For all their liberal-minded credentials, both the Mirror and the Guardian have, when the capitalist chips are down, backed the status quo and the rule of the rich. Their non-stop talk on how badly Corbyn is doing and how much better it would all be if Labour was to be returned to nice, safe, “centre ground” hands once again flies in the face of reality. These people have no answer to the millions of lost votes incurred during the Blair/Brown/Miliband years. We should also comment on the pernicious role of the television news media. They are supposed to be impartial when it comes to reporting, above all during an election. Yet over the last two years we have seen a clear tendency to push these “impartial” boundaries to their limits and beyond, not least when dealing with Jeremy Corbyn. The BBC has been under attack for several years now from a Tory government, intent on holding a gun of privatisation and budget cuts to its head. As a result, the BBC has become far less willing to ruffle the government’s feathers. The BBC has been using the same tactics that we have seen from papers like the Guardian, with Blairites popping up like magic everywhere on their channels to attack Corbyn. The BBC says they are just reporting the news as they see it – but, as a wing of the establishment, they are also shaping it. They often emphasise negative rather than positive aspects when dealing with Corbyn, being more than a little selective over their reporting and the tone used. This is nothing new either; ask the miners how they were treated by the BBC during the great strike of the 1980s. No wonder people have turned to social media to get their news, as an antidote to the tame reporting on our TV screens of what this government is doing. Interestingly, even this mock impartiality is not enough for some in the establishment. Murdoch’s News Corp want to change the laws in Britain so that Sky News can be as biased in their reporting as its counterpart, Fox News, is in America. So far nothing that has been said here will come as a shock to trade unionists or Labour activists. It reflects the nature of the press and the key question of ownership. When was the last time any major national newspaper ever supported a strike for example? Indeed, it is only when you look closer at the facts of media ownership that things start to become all too clear. The media industry is one of the most monopolised on earth. Two rich billionaires, Rupert Murdoch and Jonathan Harmsworth, 4th Viscount of Rothermere, control over 50% of all national papers sold in the UK. According to the Media Reform Council, Britain has one of the most concentrated media environments in the world, with titles owned by just three companies representing 71% of national newspaper circulation and five companies owning 81% of all local newspaper titles on sale. As of 2015: News Corp had 33.6% of the national newspaper market; Associated Newspapers 24.1%; Express Group 12.1%; and Telegraph Media Group 7%. If you add the FT at 2.6% and Independent Print Ltd at 4.5% (before the closure of the Independent as a print newspaper) then this gives a huge share of the market to papers that have tended to support the Tory Party over the years. Against this we have just the Guardian Group at 2.5% and MGN at 13.6%, although their support for Labour has always been somewhat conditional, as already outlined. This monopolisation continues into the local press. As of July 2015, Johnson Press owned 21.9% of all local titles, Garnet Group (Newsquest) 18.9%, and Tindel 11.2% – representing 52% of all titles between them. Add Local World, Trinity Mirror and Archant to the list and you account for 81% of all papers on the market. Is this monopolisation just a British phenomenon? Turn to the USA where the principle of freedom of the press is enshrined in the constitution and you find that six companies now dominate the whole media industry as against 50 in 1983. These in turn are owned by 15 billionaires. This famous saying by legendary US media critic A.J. Liebling in 1960 is evidently as true now as ever. The same story could be repeated in countries all around the world. Media for the billions, not the billionaires! “In capitalist usage, freedom of the press means freedom of the rich to bribe the press, freedom to use their wealth to shape and fabricate so-called public opinion,” he could have been writing about the situation today. Many people talk about press regulation as being the solution to the problem. Certainly what we have seen up to now has been pretty ineffective, as we saw with the phone hacking scandal. However, the question must be asked: how effective would any new system be? At worst it would be used by the government to muzzle the press in the same way that British libel laws are used. At best it would be just as ineffectual as previous arrangements, as the wealthy elite would still own and control the press, thereby changing nothing. A good example of how useless regulation is can be seen from the “Jezster” article that appeared on the front page of The Sun, claiming that Corbyn had agreed to join the Privy Council as leader of the opposition to get money for the party. The claim had no basis in fact, but all that happened was that the paper was obliged by the regulators to publish an “adjudication” some months later, buried away in a small box inside the paper. Where is the justice in this? The Sun repeated lies over the Hillsborough disaster without being punished, apart from people rightly refusing to ever buy that rag again. Socialists must stand up against the disgraceful bias of the capitalist media, but also recognize that the issue of ownership must be addressed. Without this, real freedom of the press is meaningless. Regulation and ownership controls are not enough. The media industry should be nationalised and its resources opened up to all political trends and groups within society. This fair allocation – to the billions not the billionaires -– would open up the media as a real and valued resource for all, in which quality journalism would thrive and develop. Under socialism, the media could be a defender of our rights, not a defender of privilege. All images in this article are from In Defence of Marxism.